Chem-Dry Quick Dry has been operating in Sydney for over 25 years. We form part of the largest carpet cleaning franchise in the world. It is a very highly rated company. Our Australian business form part one of the largest Chem-Dry franchisees in Australia. A substantial part of our work comes from domestic repeat and referral customers. We also service real estate agents, building companies, schools, pubs, clubs, strata managers, insurance companies and more. Throughout the years we have guaranteed high quality, professional carpet cleaning services for both domestic and commercial customers. Because we have been around for a while, our technicians are very experienced cleaners. Their stain removal skills are backed by international research undertaken in the USA that ensures that our cleaning solutions are both effective and as environmentally friendly as possible. Our approach to our staff is one of continuity. Sending the same quality technician to the same customers means that there is less certainty. This relates to the quality of the carpet and upholstery cleaning work undertaken at your home. We also believe that it builds trust. Chem-Dry is a very trusted brand around the world. Our technicians are trusted in your home to deliver consistent quality workmanship. The average technician that works for us has been in our full-time employment for over a decade. All staff has undergone extensive theoretical and practical training in all our services. This is an ongoing process as we are always adding new cleaning activities to our business. International lab tested cleaning solutions. In a time of increased allergies, our company is focussing on eco-friendly products to deliver great cleaning results. Security checks for all staff. The process of police clearances and background checks is standard with our staff. Drier carpets and upholstery mean less chance of shrinkage or mould incubation. In commercial context – our cleaning leads to much less downtime for your enterprise. As your local carpet cleaning company, we will always try and offer you an affordable rate whether your after upholstery cleaning, carpet steam cleaning, tile cleaning or any other service on offer! We are one of the leading carpet cleaners in Sydney! Don’t wait around for another carpet cleaning company again, we’ll come out at a time that suits you and unlike other company’s – we won’t leave your home or business with a wet mess! Part of our service involves 24-hour emergency water damage restoration. This service is available 7 days a week. Over the last decades, we have invested in training and drying equipment to ensure that you get high-quality responses to your wet carpet emergencies. We love giving you as much advice as possible. 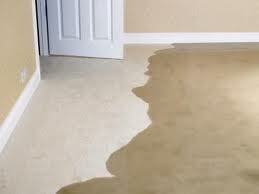 Have a look at our pages on carpet maintenance and water damage advice. It is the least we could do to share our practical experience with you. Our frequently asked questions page also tries to answer additional queries. Do not fear – we are only an email or call away if you still want more information. There are not too many cleaning challenges that we have not encountered at some stage. Even if our staff do not have all the answers on the day – we will find out for you. At our company, we love to solve problems. Areas Chem-Dry QuickDry Service. Service Quotes – For all rug cleaning, including rug cleaning and upholstery cleaning. Loyalty program – Learn more about the Chem-Dry QuickDry’s loyalty card. FAQ – Chem-Dry QuickDry is answering your questions. Pet Odour Removal Service – Chem-Dry QuickDry specialise in removing nasty odours. Dust mite protection – Another Chem- Dry specialty service. 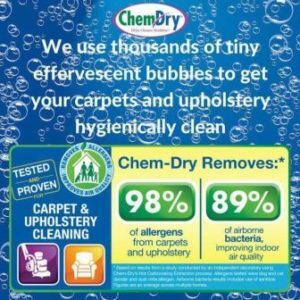 Chem-Dry Products – For upholstery cleaning, rug cleaning and much more Chem-Dry Water Damage Restoration. Don’t sit around wondering; call us for a free quote now!